Mapping the demographics of communities around key pollution sources is a good first step toward ensuring environmental justice. According to the EPA, “Environmental Justice is the fair treatment and meaningful involvement of all people regardless of race, color, national origin, or income with respect to the development, implementation, and enforcement of environmental laws, regulations, and policies.” A map that reveals a greater share of people of color or low-income living near a proposed pollution source (relative to some reference population), can indicate the presence of an environmental justice issue. This is particularly true for communities that already suffer from disproportionate environmental impacts and lack political representation. Environmental justice is not simply a matter of who lives in the area – people of color, low-income residents, children, the elderly, etc. The demographics of those that spend time there are also important. Are there schools within the community? Hospitals, clinics, or care facilities? Community or religious centers? Who is affected by the emission of pollutants, and what are their health risks? These are questions that should be asked when any new pollution source is being proposed. EJView, the EPA’s environmental justice mapping program, is often a great place to start looking for answers. In some areas, such as Minneapolis/St. Paul and the State of California, community groups and government agencies have created their own interactive environmental justice mapping programs. While mapping community characteristics and environmental risks is a powerful starting place, environmental justice mapping is just one element within a comprehensive set of tools that can be used to identify the potential for environmental injustice, better inform a community about pollution sources and health risks, and strengthen the voice of concerned community members in public decision making arenas. Using commonly available data sources to create environmental justice maps also has limitations; in many cases additional analysis and local insights are needed to better understand what is happening on the ground. Some communities have “too much” information, and the challenge becomes displaying an array of relevant factors in a clear, concise, and meaningful way. 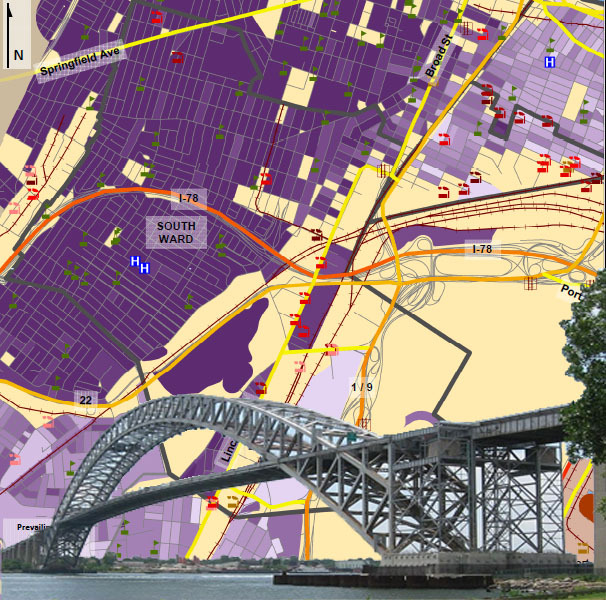 Overall, however, mapping is a powerful tool in the environmental justice toolbox which should not be overlooked. The demographics and pollution source mapping conducted by Sustainable Systems Research for the region surrounding the Port of New York and New Jersey was used not only as an informational tool for community groups and residents but also to support a technical review of the Bayonne Bridge Navigational Clearance Program Draft Assessment. Raising the Bayonne Bridge, as the program proposes, will allow larger container ships to enter the Port. Our maps help determine who will be impacted most by the resulting pollution changes and ensure that environmental justice in these communities will not be overlooked.